Blount Small Ship Adventures is offering two new cruises this year that feature Canadian waterways in Ontario. The small size and unique design allow its ships to sail through waterways that bigger cruise ships cannot reach. The company also offers savings of up to $1,000 per couple on select departures of the Ontario cruises when booked by Aug. 5, 2011. It is valid on new bookings only. Plus, AARP members receive up to $100 in shipboard credit. The itineraries were developed as part of a partnership between Blount and the Ontario Tourism Marketing Partnership. One of the cruises travels from New York City to Toronto, while the other goes from Toronto to Midland, Ontario, with a highlight on Georgian Bay. “Skylines & Islands: New York City to Toronto” includes New York’s small towns, including Little Falls, Sylvan Beach and Oswego, as well as the St. Lawrence Seaway, the Thousand Islands and Niagara Falls. The ship will retract its pilot house to cruise the Hudson River and the Erie Canal. “Discover Ontario: Scenic Georgian Bay” cruises the Welland Canal and explores Cleveland, Detroit and Goderich, Ontario. The cruise also sails on Georgian Bay and visits Manitoulin Island and Midland before returning to Toronto. There are four 2011 departures. “Skylines and Islands” between New York City and Toronto departs on July 13 and Aug. 5. 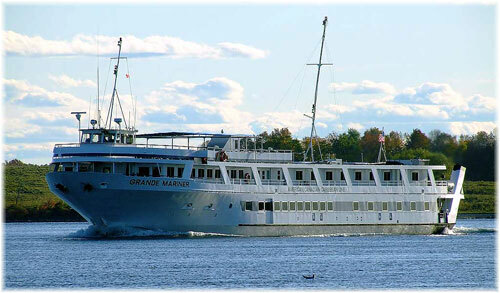 “Discover Ontario: Scenic Georgian Bay” departs on July 14 and July 25. The July 14 departure is not eligible for $200 discount per couple. For more information, call 800-556-7450 or visit www.blountsmallshipadventures.com.